Ask anyone about their fond memories and it would be to go back to their days in college. And no college life is complete without the hours spent at everyone’s favorite spot – the canteen. Just the words 'college canteen' are enough to make you feel nostalgic. Need to satiate your hunger? 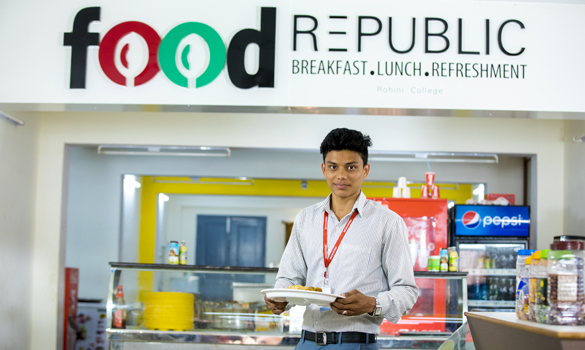 RCET provides Food Republic, a full service canteen which is located in the mid of the campus. It is accessible to the students for 18 hours a day and also open to the public. Serving extremely cheap and reasonably hygienic, vegetarian and non - vegetarian food,. Even though the campus is filled with multi-cultural students our canteen satiates the hunger and feel the taste of their homemade food. . To provide food and protected with hygienic environment along with dining hall which can accommodate more than 400 students at a time. Pure water is the world’s first and foremost medicine.We provide RO purified water throughout the campus. It also stocks a selection of cakes, biscuits and other confectionery as well as delicious freshly prepared tea and coffee. A sizeable canteen with no compromise on hygiene, the college is known to serve a variety of dishes which is considered the favorite hangout zone by students. A wide variety of food obtains at the lowest rates and keeps student pretty pleased. The spacious canteen is seen as the hub of all activities with students who get to break free from routine life to have a quick bite of appetizing food. Food Republic is the perfect place to relax and enjoy a snack! Excellent service. Great staff. Must experience.